Oh no! Imagine that the world wakes up one day and no current technology works. There are no phones, no computers, no Internet, no cars, no video games, no televisions, no iPods, etc. 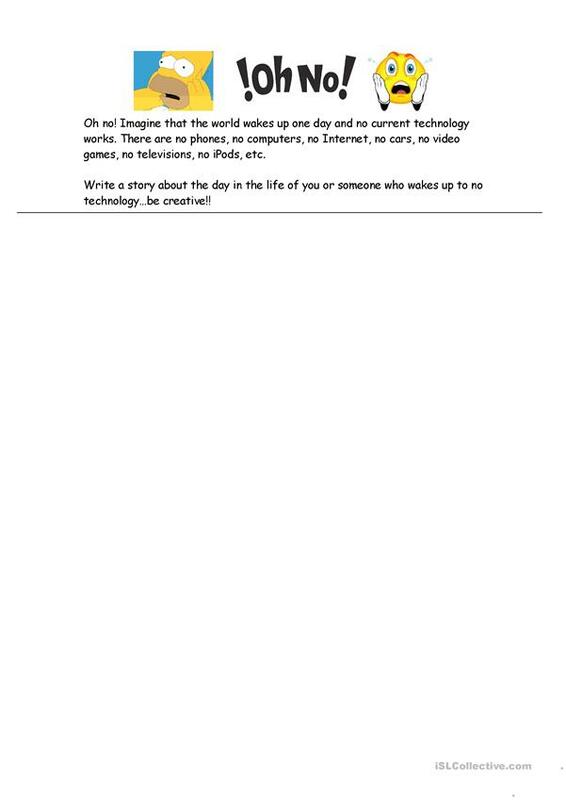 Write a story about the day in the life of you or someone who wakes up to no technology…be creative!! This downloadable printable was created for elementary school students at Elementary (A1) level. It is useful for honing your groups' Writing skills. It is focused on the vocabulary topic of Computers & Technology. jasmu1mn is from/lives in United States and has been a member of iSLCollective since 2012-02-03 21:45:46. jasmu1mn last logged in on 2015-04-27 17:08:57, and has shared 1 resources on iSLCollective so far.